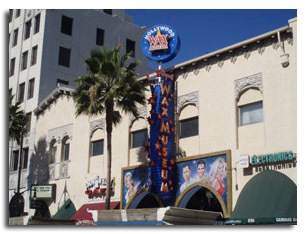 The company was established in 1925 in downtown Hollywood by a general contractor looking to specialized in the booming Hollywood commercial construction market. He soon partnered up with an aspiring residential roofing contractor, enabling the young company to expand into all realms of the roofing business. 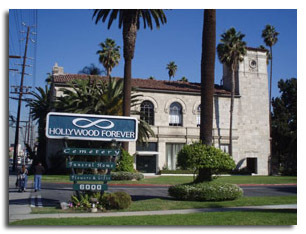 They incorporated in 1942 and became the premier union contractor for the Hollywood movie, radio and television scene. Having a rich family background in the roofing industry (4 generations) I realized, after graduating from UCLA, that roofing was in my blood. 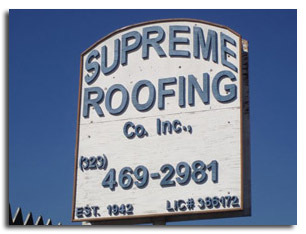 I interviewed with Supreme Roofing in 1987, and within two years was lead estimator for the Company. By 1999 the boss was ready to retire after 35 years at the helm. I purchased the Company from him and here we are today, as the fourth owner of the Company, continuing the tradition we have become famous for. I am currently the sole owner, estimator and job supervisor. With just under 10 employees I find it quite enjoyable to wear all these hats. So, we’re here for the long haul; ready to help you with your roofing needs. 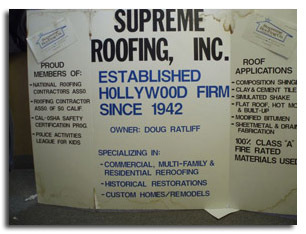 A few important customers that entrusted their structures to Supreme crews were Paramount Studios, CBS Studios, Warner Brother Studios-Hollywood, The Hollywood Palladium, Raleigh Studios, Capitol Records, The Henry Fonda Theater, Groumann’s Chinese Theater, The Magic Castle, The Hollywood Bowl, Sunset Sound Recording Studio, The Laugh Factory, The Farmer’s Market, The Hollywood Wax Museum, The Hanna-Barbara Studios, The Hollywood Cemetery, The Hollywood-Roosevelt Hotel, the Charlie Chaplin Studios and A&M Records. A slow down in the new-construction commercial market forced the now 60-year-old company to concentrate on the residential and commercial re-roofing sector by the mid-1980’s. 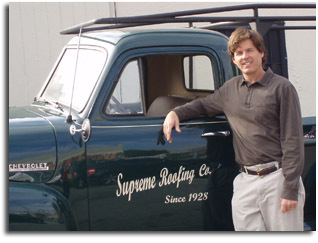 Down-sizing their operations, Supreme Roofing dropped their union affiliation and focused on the affluent residential markets of Beverly Hills and Hancock Park. The sustained clientele had grown so large that 80% of their business was previous-customer or referral based work. Today that number is up to 96%, thanks to strict adherence to “Rule #1”. It’s not about closing the deal, it’s about opening the relationship. 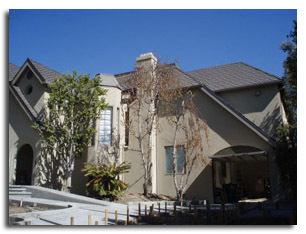 We like to say that we specialize in the residential re-roofing market. 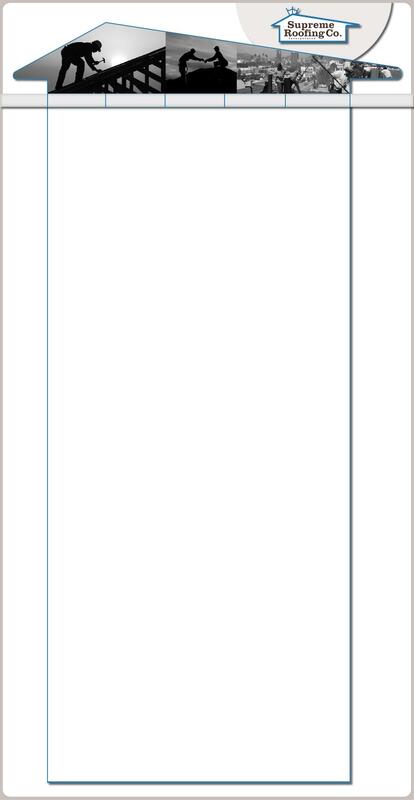 This accounts for about 70% of our total sales. This category can be broken down into single-family homes and multi-family dwellings. The remaining 30% is divided up in to small commercial and industrial re-roofing projects. We have recently expanded our “service & maintenance” division of the Company to enhance our warranty program which is quite beneficial to both commercial building owners and home owners alike. There has been a plethora of technological advances in the roofing industry over the last two decades due to higher quality control guidelines, ecological considerations, building code regulations and improved safety standards. Roofing in general, whether it be residential or commercial, can be divided up into three categories - dead-flat, low-slope and steep-slope. All buildings designed and built today must fall into the low-slope or steep-slope categories. There are still many roofs in existence that have little or no slope (the dreaded dead-flat roof). 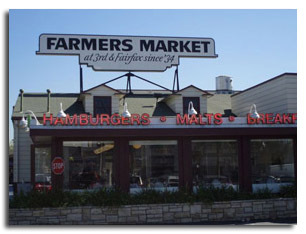 Historically, most roofs were made of asphalt saturated organic felts formed into shingles and rolls, cedar shakes and shingles, clay and slate tiles, and aggregates. Today we see rubber-modified asphalts, fiberglass and polyester felts, plasticized membranes, and concrete and rubber tiles; all of which meet the Class “A” fire rating required by local city ordinances. These changes have greatly improved the quality of the roof systems applied on todays homes and commercial structures. Supreme Roofing integrates old and new technology to meet the demands of a highly diversified market.